Singing cowboy and 20th century superstar Gene Autry was born on this day in 1907, and to commemorate the occasion, here is Autry’s first hit, featuring his early duet partner Jimmy Long. 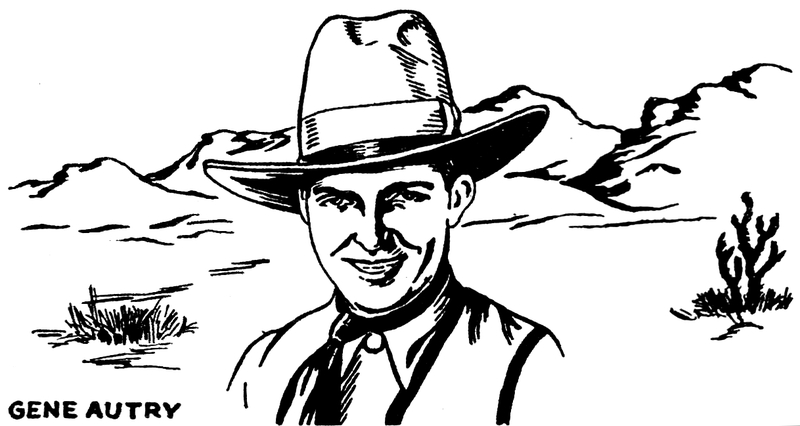 A depiction of Gene Autry featured on an early 1930s Perfect record sleeve. Gene Autry was born Orvon Grover Autry on September 29, 1907 in Grayson County, Texas, near Tioga. After high school, he worked as a telegraph operator for St. Louis–San Francisco Railway, and would sing and play guitar on slow days. After losing that job, Autry sang on Tulsa’s KVOO, and when Will Rogers encouraged his singing career, he went to New York for an audition with the Victor Company, which wound up producing one record with Jimmy Long and Frankie Marvin on steel guitar. After Victor, Autry recorded for Columbia, which yielded several releases on their budget labels, in the style of the famous singing brakeman Jimmie Rodgers. 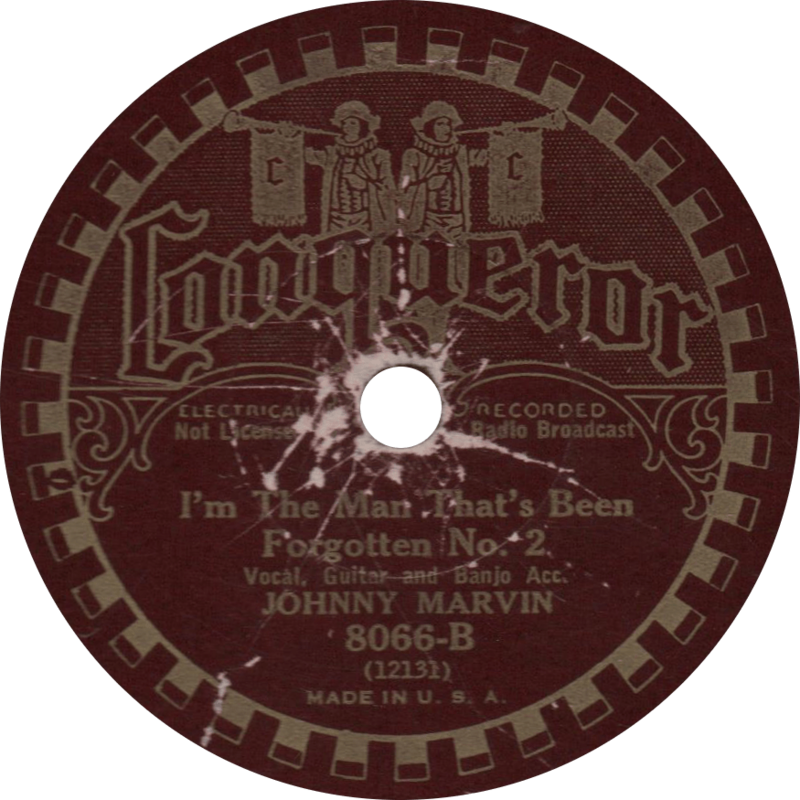 After Columbia, he recorded for Gennett and the American Record Corporation, staying with the latter for many years. In 1934, he was “discovered” by Nat Levine of Mascot Pictures and made his motion picture debut in In Old Santa Fe, becoming the original singing cowboy of the screen. Before long, Autry became the top singing cowboy on film until he was surpassed by Roy Rogers, and his blue yodeling style was replaced with a more Western repertoire. He had hit records with “Silver Haired Daddy of Mine” in 1931 (and again in ’35), “Back in the Saddle” in 1939, and the Christmas classics “Here Comes Santa Claus” and “Rudolph the Red-Nosed Reindeer”. During World War II, Autry served in the Army Air Corps. In the 1950s, Autry appeared in his own television program, and became involved in baseball. He retired from show business in 1964, having made over one-hundred films and over six-hundred records. Autry died of lymphoma on October 2, 1998. He is the only person thusfar to be awarded stars on the Hollywood Walk of Fame in all five categories. 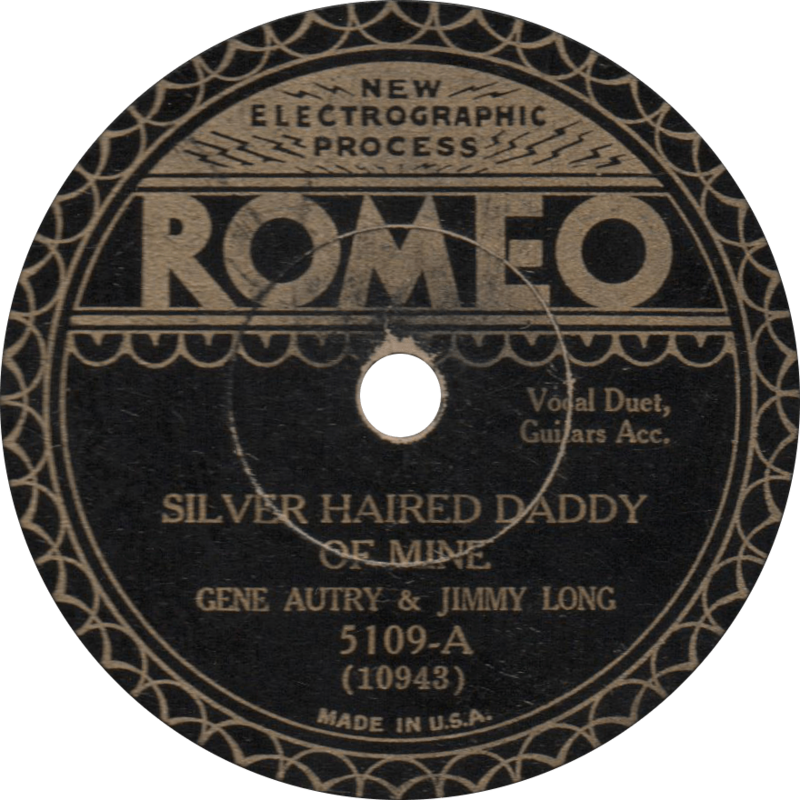 Romeo 5109 was recorded on October 29 and 30, 1931 in New York City by Gene Autry and Jimmy Long. In addition to Autry’s guitar, the pair are accompanied by Roy Smeck on steel guitar. Sentimental to the point of sappiness (and truly a piece of Americana) “Silver Haired Daddy of Mine” was Gene Autry’s first big hit, and one of his most enduring songs, making its biggest success in 1935 when Autry sang it in Tumbling Tumbleweeds. Silver Haired Daddy of Mine, recorded October 29, 1931 by Gene Autry & Jimmy Long. Following the same formula as the previous, on the flip, they perform “Mississippi Valley Blues”. 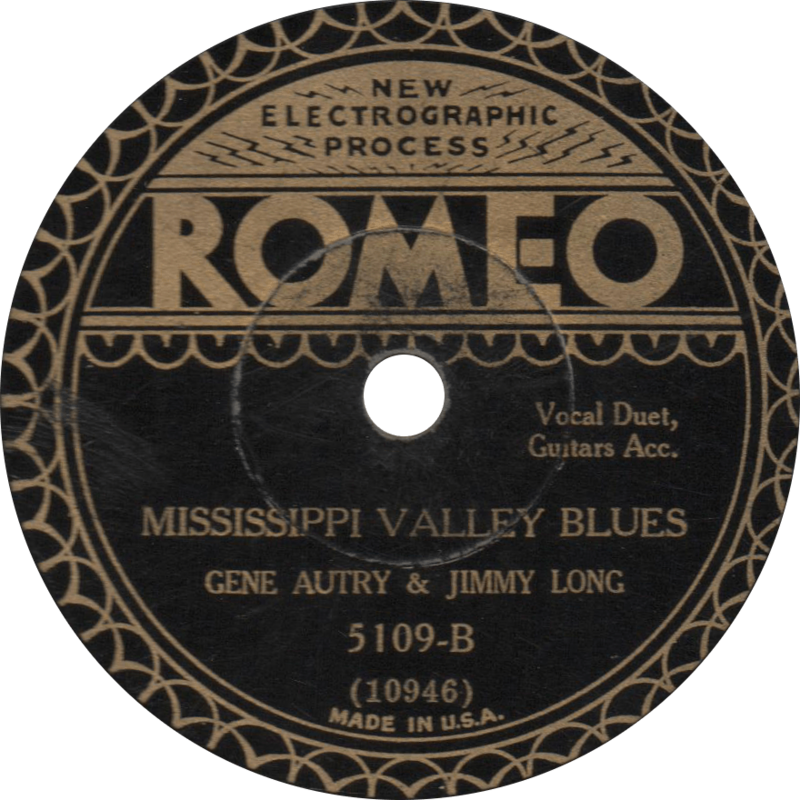 Mississippi Valley Blues, recorded October 30, 1931 by Gene Autry and Jimmy Long. It’s time now for more music for music’s sake, and it’s hard to go wrong with a Columbia Viva-Tonal, they tend to sound decent even when they’re beat to hell! There were a number of bands to go by the name “The Georgians”. The one in question here was a jazz ensemble made up of members of the Paul Specht Orchestra, and led by trumpet player Frank Guarente. Guarente’s Georgians first recorded for Columbia in 1922, and traveled to Europe later in the decade at least once, making a number of recordings in Switzerland. There seems to be some uncertainty as to when the original Georgians broke up. Some sources indicate that they disbanded in 1924, and that Columbia later used the name for different groups. Other sources indicate that Guarente continued to lead the band until several years later. Columbia 523-D was recorded November 18 and December 12, 1925 in New York, New York. According to the DAHR, this session was still under the direction of Guarente, and reportedly includes the talents of Charlie Spivak on trumpet, Al Philburn on trombone, Ernie Warren or Frank Kilduff on clarinet, alto sax, and baritone sax, Gilbert Dutton on clarinet and tenor sax, Walker O’Neil on piano, Roy Smeck on banjo and harmonica, and Johnny Morris on drums. First up is “Clap Hands! Here Comes Charley!” a dandy little tune, featuring a vocal by drummer Johnny Morris. While Rust notes Smeck as doubling on harmonica on this side, the instrument has always struck my ear as sounding like a goofus (aka Couesnophone), a toy saxophone adopted in jazz music by Adrian Rollini in 1924, I’m not sure who’s playing it here. Recorded on the latter of the two dates, the DAHR shows takes “6” and “7” as issued for this side, this is “7”. Clap Hands! 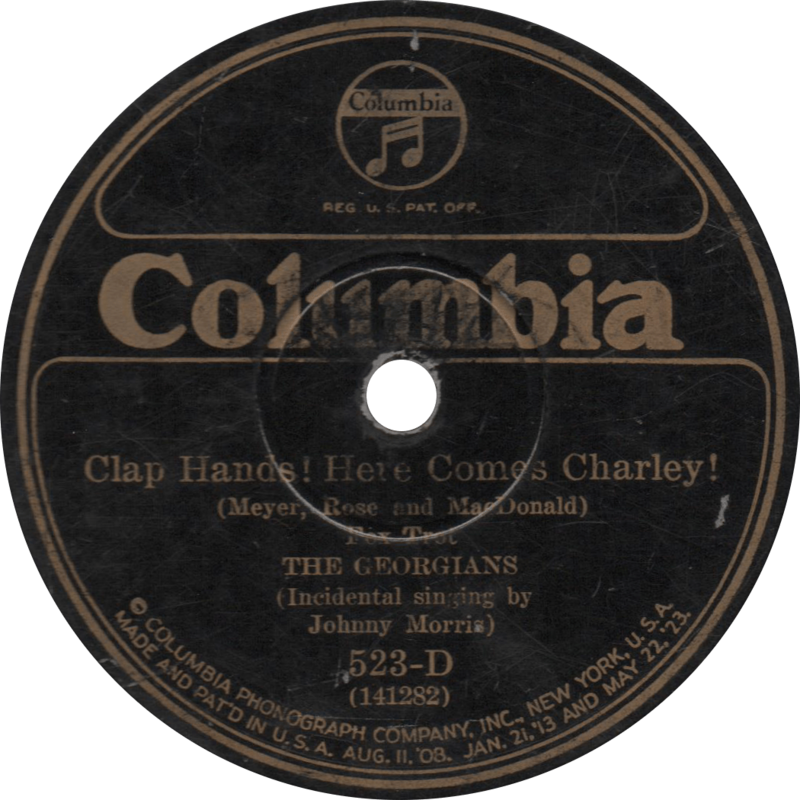 Here Comes Charley!, recorded December 12, 1925 by The Georgians. “Spanish Shawl” has quite a ding in the label, but on the bright side, it creates a good cross-section of the unique composition of Columbia records; coarse shellac in the middle, surrounded by a paper coating, and topped with a playing surface of smooth laminate in which the grooves are pressed. This side was recorded on the earlier date. 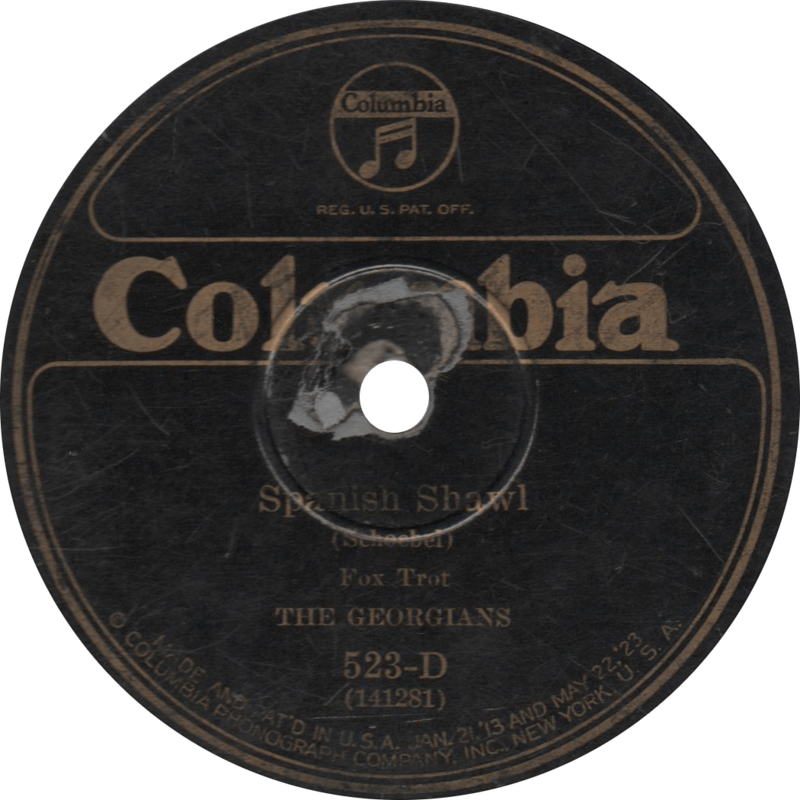 Spanish Shawl, recorded November 18, 1925 by The Georgians. Updated on June 24, 2016 and with improved audio on April 30, 2018. 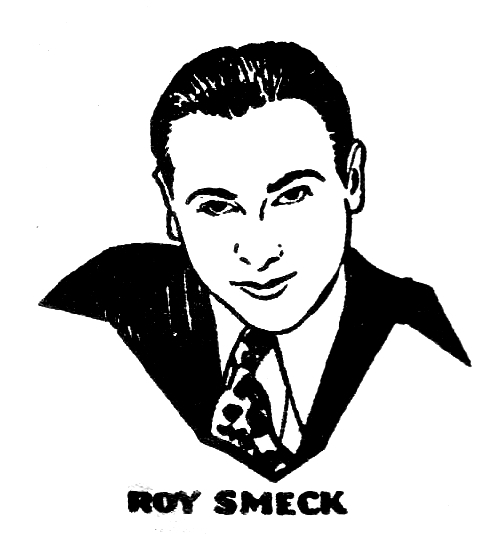 An illustration of Roy Smeck from 1930s Perfect record sleeve. Roy Smeck, “The Wizard of the Strings” was born on this day 116 years ago, on February 6, 1900. Roy Smeck rose to prominence in the 1920s with vaudeville performances playing his plethora of stringed instruments, including an eight string Hawaiian guitar known as an octo-chorda. Riding the Hawaiian music wave of the 1920s and 1930s, he made his great fame in the budding field of radio, becoming known as the “Wizard of the Strings”, and records by his ensembles sold huge numbers. In 1926, Smeck had the distinction of appearing in one of Warner Brothers first Vitaphone short sound films, called Roy Smeck: His Pastimes. He would continue to make numerous other filmed appearances over the course of the next decade. In the 1930s, Smeck’s fame was such that he played at Franklin D. Roosevelt’s 1933 inaugural ball and King George VI’s coronation review in 1937. By the 1950s, however, Smeck had slowed down, though he still made occasional performances. In 1985, Smeck appeared in Wizard of the Strings, an Academy award nominated documentary about his career and life (which is a great film, by the way, and I recommend seeing it.) Roy Smeck died April 9, 1994 at the age of ninety-four. Homestead 16002 was recorded April 3, 1929 in New York for the Plaza Music Company by Roy Smeck’s Trio. It was also issued on Banner 6368. The vocal on both sides is by Scrappy Lambert, under name Larry Holton, one of his many pseudonyms. The Homestead label was sold by the Chicago Mail Order Company, and was made from Plaza/ARC masters, much like Sears, Roebuck’s Conqueror label. First, Smeck’s trio plays a dandy little version of the 1929 hit song, “A Precious Little Thing Called Love”, the theme song of The Shopworn Angel. 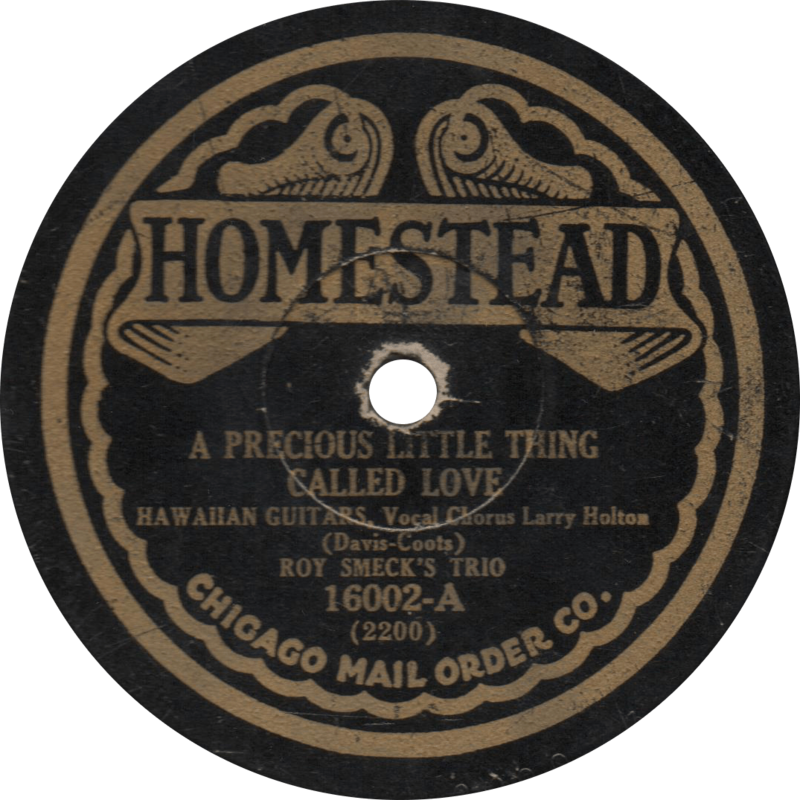 A Precious Little Thing Called Love, recorded April 3, 1929 by Roy Smeck’s Trio. The next tune is a Hawaiian one through and through, titled “My Hawaiian Queen”. 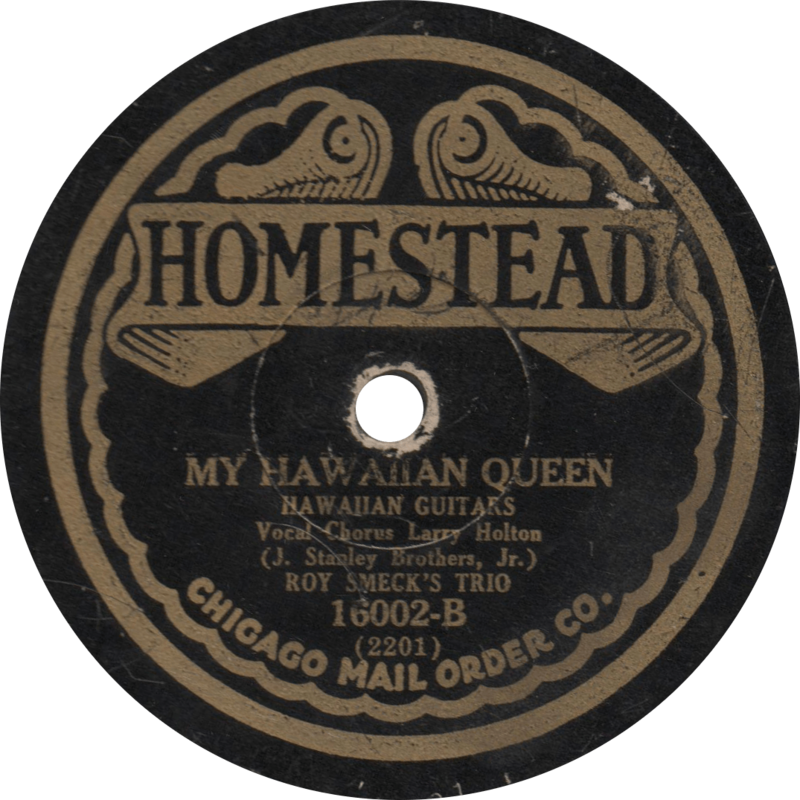 My Hawaiian Queen, recorded April 3, 1929 by Roy Smeck’s Trio. 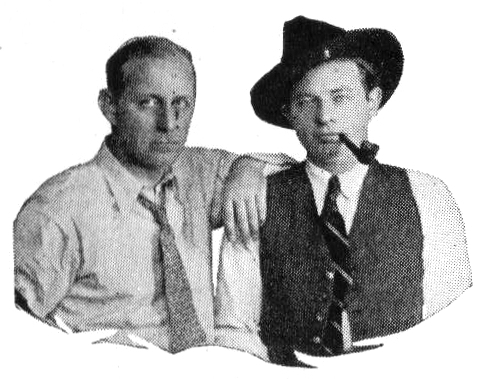 Carson Robison and Frank Luther as “Bud and Joe Billings”. From Victor catalog, 1930. So far I’ve mostly shared jazz records, so I think it’s about time I broke the monotony with something a bit different, so here’s one of my favorite country records, by Frank Luther and Carson Robison. Carson Robison started out his lengthy and prolific recording career as a guitar player for vaudevillian Wendell Hall in 1924, becoming a studio guitarist and whistler for Victor records. Later that year, he was teamed up with the classically trained hillbilly singer Vernon Dalhart, beginning a partnership that lasted until an acrimonious parting in 1928, and would define “citybilly” music. Soon after, Robison joined forces with minister-turned-singer and fellow Kansan Frank Luther, who had previously sung with the Revelers and as a popular dance band vocalist, and the pair went on to supersede Dalhart as some of the nation’s foremost country recording artists. Their partnership lasted until 1932, when Robison set sail with a new group to bring hillbilly music to the British Isles. Luther continued to record domestically. Supertone S2061 was recorded on May 21, 1929 and December 10, 1928, respectively, in New York City. 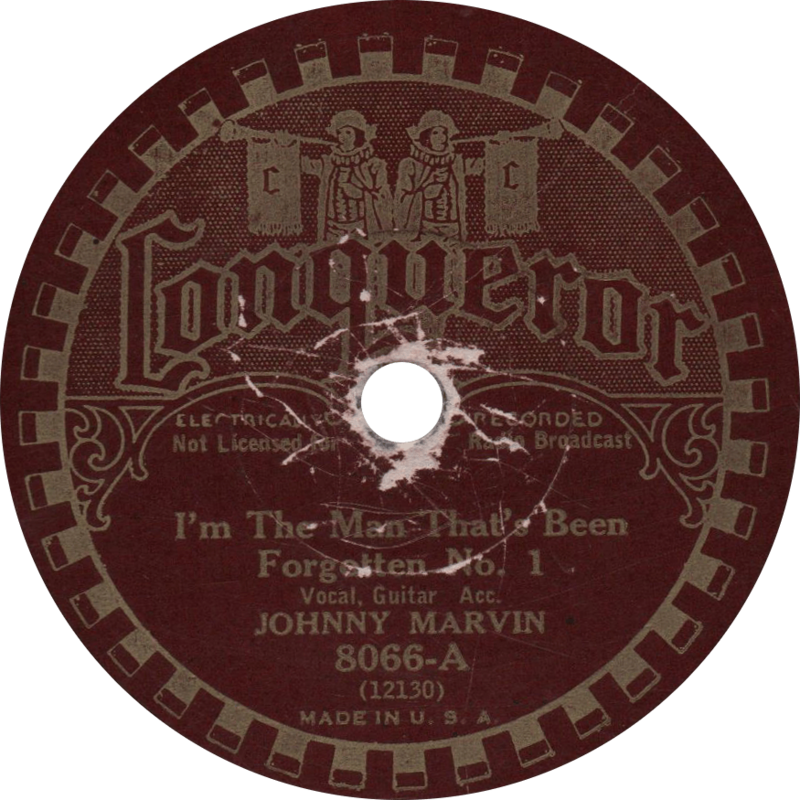 The two sides were originally issued apart, with the first side on Brunswick 425 and the second on Vocalion 5278. This Supertone was released around 1931, and draws its masters from the Brunswick/Vocalion catalog rather than the original Gennett masters, after the Brunswick Radio Corporation (a subsidiary of Warner Brothers Pictures) acquired the contract from the Starr Piano Company. 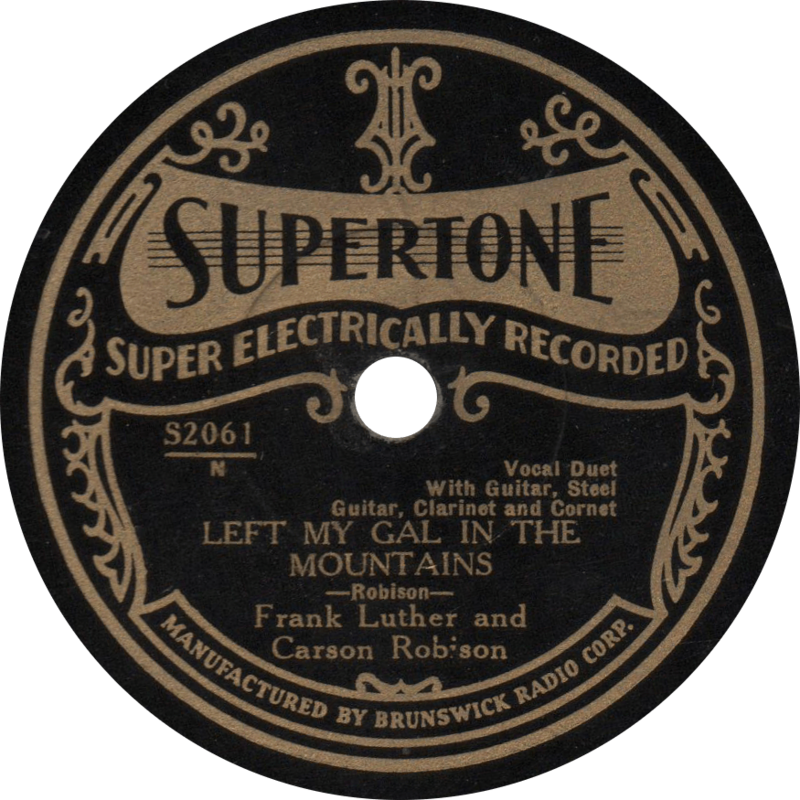 On the first side of Supertone S2061, Frank Luther and Carson Robison perform “Left My Gal in the Mountains”, one of many country songs written by Robison and recorded by the duo on numerous labels. The accompaniment—made up of Earl Oliver on cornet, probably Roy Smeck on steel guitar, and an unknown clarinettist and guitarist—adds a little jazz to the song. Left My Gal in the Mountains, recorded May 21, 1929 by Frank Luther and Carson Robison. On the flip-side, Luther, accompanied by Robison on guitar, sings Harry McClintock’s famous “Big Rock Candy Mountains” in an almost flawless imitation of Mac. 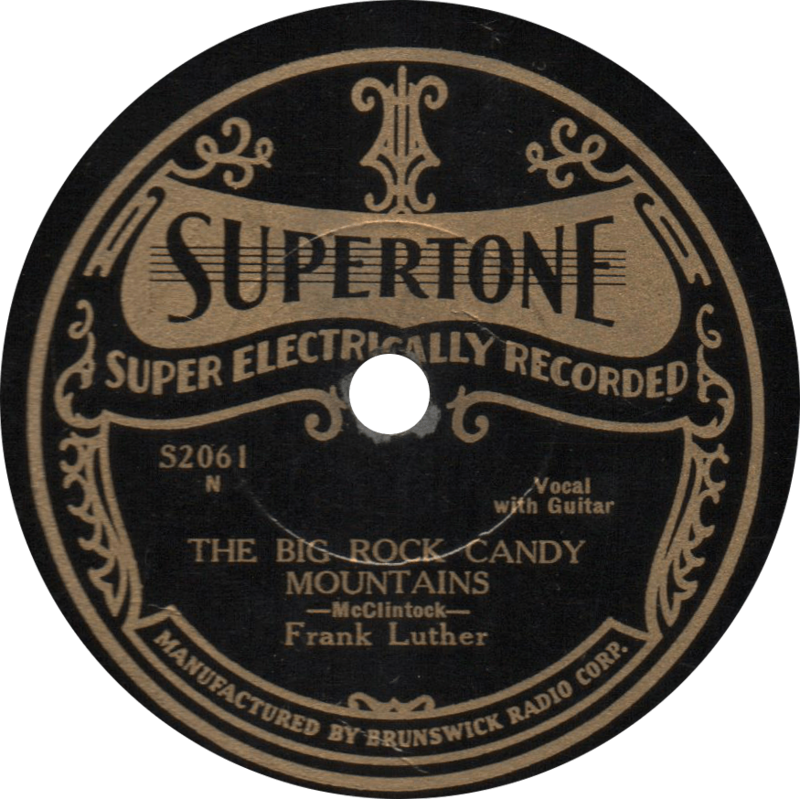 The Big Rock Candy Mountains, recorded December 13, 1928 by Frank Luther. Updated on October 2, 2016, and June 10, 2017. Some like Chicago, some love Memphis, Tennessee. Give me sweet Dallas, Texas, where the women think the world of me!